Lebanese-Dutch Tarek Atrissi is one of most recognized designers across the Arab world. He established in 2000 his Netherlands-based design studio, Tarek Atrissi Design (www.atrissi.com), with a current base office in Barcelona. The studio’s typographic and cross cultural design approach has gained an international reputation and produced projects that left a significant influence on the contemporary graphic design landscape in the Middle East. Atrissi was listed in 2017 as one of the most influential 100 Lebanese professional figures around the globe, and was named a distinguished Alumni from both the American University of Beirut and the School of Visual Arts in New York. His awards includes TDC New York, the Adobe Design Achievement Awards, and the Design for Asia Award, among others. The Netherlands, Qatar, Dubai, Spain and the United States. He holds a Bachelor’s degree in Graphic Design with distinction from the American University of Beirut; a Masters of Arts in Interactive Multimedia from the Utrecht School of the Arts in Holland; and an MFA in Design entrepreneurship from the School of Visual Arts in New York. He holds as well a postgraduate degree in Typeface Design from the type@cooper program of the Cooper Union New York. 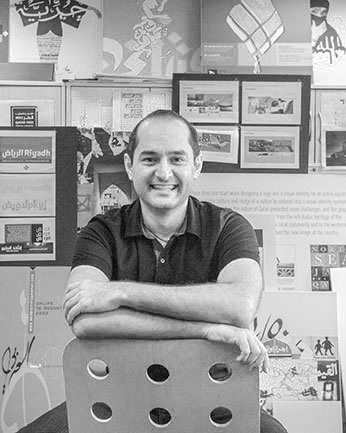 He has been on the judging panel of some of the most prestigious international design competitions, including the Tehran Typeface Design competition in Iran, The Taiwan International Student Design Competition, The TDC competition in New York, and 100/100 Poster design competition in Egypt. He has given lectures and talks about design in universities and conferences in more than 25 countries. He is board member at Creative Industries Fund NL in the Netherlands: the Dutch cultural fund for architecture, design and digital culture. designers with strong interest in Arabic typography.